Hidden in Chianti, between Lucca and Florence, is the city of Pescia. It is located at the bottom of a valley, acting as a hinge between the hills and the plains, covered with olive groves that give the impression of being gardens. The river running through the city bears the same name and together unites and separates Pescia with the Cathedral Bridge acting as city centre. In the Middle Ages, on the left bank of the river, the houses once surrounded the Parish Church, today the Cathedral, which formed the hub of the city growth. On the opposite bank, a castle, a market and a feudal court spurred the arrangement of houses in long rows, parallel to the river. A fortified bridge assured the union between the two city souls. Today Pescia has many interesting sites to visit in town, relics of its glorious past, as well as in its surroundings, the province of Pistoia, only a few kilometres from great art centres such as Florence, Lucca and Pisa. 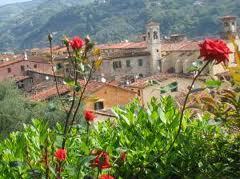 For information on holiday accommodations in the province of Pistoia please visit Tuscany Holiday Rent. 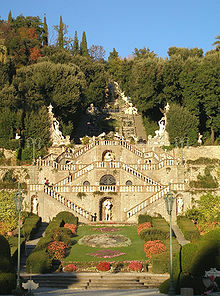 Known in the 19th century as “the little Manchester of Tuscany” for its importance in silk production, today Pescia is notorious as an international market centre for carnations and for the magnificent water garden of Villa Garzoni, which also houses the Pinocchio Theme Park, in nearby Collodi. 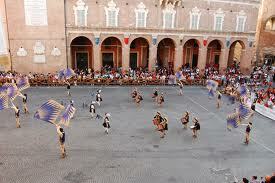 However, every year, on the first Sunday of September, Pescia’s name is linked to its Archery Palio, Palio degli Arcieri, during which the city assumes a striking guise with the streets and the squares of the historic centre embellished with the standards of the four contending quarters. From the 27th August to the 4th September, therefore, Pescia will be busy with many events. Starting off with the opening ceremony with street performances, such as tumblers, fire-eaters, jugglers and much more, the event proceeds on Sunday 28th with the first challenge, a daring game of “Palla al Paniere”, something similar to basketball, as well as the medieval arts and crafts market with the display of the local products of the 10 Castella, the small medieval villages that make up, what Genevois historian and economist de Sismondi baptized, the Switzerland Pesciatina. do with the city’s history. The “Cencio” is then delivered to the representatives of the quarter who won the preceding edition to be conserved until the prize awarding. The ceremony takes place in Piazza Grande at the rhythm of drums and trumpets, with flag-wavers and the girls of the historic dancing company. Then it is the turn of the sword duellers and finally the true stars of the event appear, the archers. The day carries on with the blessing of the Palio and the Standard of the four quarters, the evening historic retinue by torch light and ends with the proclamation of Lady Pescia who will participate at Saturday evening’s 12th Edition of “the Beauty and Elegance of Women in the Middle Ages and the Renaissance” contest. 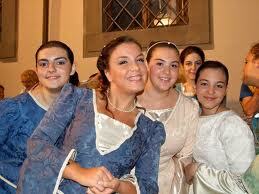 Every year this event draws to Pescia beautiful girls from many other towns, all dressed in precious vintage clothes. 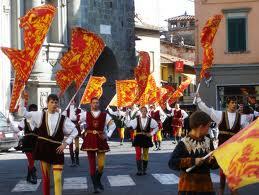 Sunday 4th will start with the herald proclaiming the beginning of the Palio. A historic retinue of 600 participants will parade through the streets in his wake until Piazza Grande where visitors will be awaiting the start of the competition. Each quarter has four archers, plus a reserve, who compete in three volleys. The targets consist of a disk of straw, or straw mattress, with a diameter of 130 cm on which are chalked circles. At the end the winner is proclaimed by the Podestà and the evening concludes with the typical Palio dinner in honour of the winning quarter.